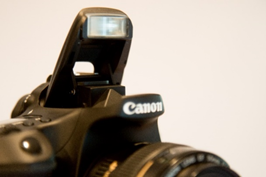 Some DSLRs have a built-in flash above the lens that pops up when needed. DSLRs designed for professionals don’t have a built-in flash. This seems counter-intuitive, and like articulating displays, it’s one of the few examples of a feature that’s cut from higher-end cameras. I like having a built-in flash on a DSLR. Sure, it never looks as nice as an external flash, but it’s convenient because it’s always with you, and it’s better than nothing. So, why don’t pro DSLRs have a built-in flash? Because pros tend to plan ahead and carry a larger flash when they need it. Also, weather sealing is more important to pros than convenience, and a pop-up flash is difficult to make weather proof. If you get a pro-level DSLR without a built-in flash, be prepared to also buy an external flash and carry it with you. If you get a consumer-level DSLR with a built-in flash, you should also be prepared to buy an external flash, because the built-in flash is quite ugly.